What colour would a forest be if it were only one colour? 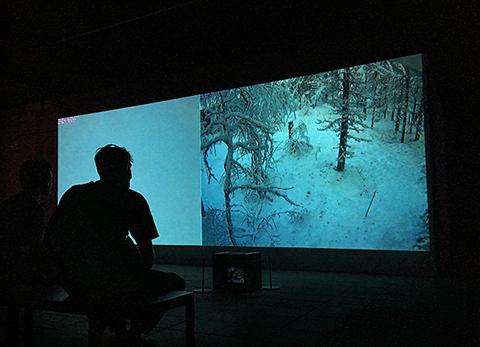 The two channel video installation shows tenthousands of images taken from scientific observation cameras of a forest in Finland over the course of two years – and their average RGB colour values. The point of departure of the investigation was a conversation with the forest researcher Pasi Kolari. Being asked by the artist if there is such a thing as beautifull data, the scientist showed a statisttical curve that he loved, representing the incoming and outgoing greeness of a forest. The left channel shows the awakening and the sleeping of the trees over a year by showing a monochrome color field. The color is precisely calculated and reveals the average colour value in RGB of the landscape of each webcam image, generated by a tailor-made software by Christian Dietz. Rapidly changing glimpses reflect the colour palette of the nature, days and nights as well as the year’ s cycle. The right channel shows the immediate reality of a boreal forest – the very one of which the RGB data were generated from: webcam images taken from scientific observation cameras of several forest field stations in Finland over the course of two years (2014-2016) to monitor phenomenological events during one year’s period. The sound track is echoing the blinking colour narration - composed and performed by Michael Moser. In cooperation with: Pasi Kolari and the SMEAR Station Hyytiälä Finland, University Helsinki and Climate Whirl.